Mau Mau is a card game for 2 or more players that is popular in Germany, the United States, Brazil, Poland, the Netherlands and some other areas. For more than 5 players, 2 packs of cards may be used. Whoever gets rid of his/her cards first wins the game. Mau Mau is very similar to the game Uno and Flaps, both belonging to the larger Crazy Eights or shedding family of card games. However Mau Mau is played with a regular deck of playing cards. However, there are a large quantity of unusual, and confusing rules. One may not speak of the rules, and the rules vary from group to group, and even within groups. A chairman (sometimes called the "Mau Master") is usually elected before the first round, and generally whoever has won the previous round, is elected the new chairman. The chairman may edit the rules however he or she sees fit, but they still have to follow their own rules. Rules for Mau have existed at least since the 1930s. A Swiss version of the game called "Tschau Sepp" ("Bye Joe", because that is what you have to say before putting down your last card but one) has existed at least since the early 1960s. One wins the game by getting rid of all of their cards. Most of the time, the winner will have to say something (Usually "Mau") at this point, or they will be given penalty cards, and will have to get rid of those before winning. If their last card is a Jack, they must reply differently (Usually "Mau Mau"). A King and Queen of the same suit can be played at the same time in a marriage. No players are allowed to make commentary without saying "Point of Order" first and end by saying "Point of order over." During Bleeding Mao, any people who see another's cards must say, for example, "Bleeding Queen of Spades," and hand that person a card from the deck. When a 2 of any suit is played the player must jump up and down 2 times the number of cards the next player has. Players may not touch their cards during Point of Order. Player of a red 7 must turn to the player on their left and say "Have a nice day," knock the table, and give them one card from the deck. Player of a black 7 must say "Have a very nice day" to the player on their right, knock the table, and give them two cards from the deck. Cards of the same value can be played all together within one turn. Whenever a Queen is played, the person who played it must say, "wee!" or "The Queen is in the court." Player of a king must say, "All Hail Chairman Mao." or "All hail the king." Players must say "Mau" when they have only one card left. A jack reverses the direction of play (clockwise and counterclockwise), or lets the player take another turn before reversing. A player who fails to notice that the direction was reversed and plays out of turn must draw one card. When you draw cards (e.g. when you pick two after a 7, or a card from the stack when you can't play), you may put a card down immediately. Whenever a card of spades is placed on the stack, the player must say, "___ of Spades." The winning player "wins the deal"
When a player plays the 4 of diamonds, they must say, "Let's Play Baseball"
When a player plays a 3 of any suit, they must say, "Tally Time", to which all others playing must reply "SHUT UP!" Anyone can penalize anyone who breaks the rules and must explain why they were penalized. The penalized player must always respond "thank you" for every penalty given. In Austria and Bavaria a variation on the game is known as "Neunerln". In Portugal, a variation on this game is called "Puque" (reads as Poock, in English). The rules are almost the same, with the 2 replacing the 8 as the "skip turn" card. One must say Puque when one plays his next-to-last card, and doesn't have to say anything different from end with a Jack, still getting the double score. In the UK, a variation on the game is known as Switch. The common rule differences are that two rather than seven causes the following player to pick up two cards, playing a jack will "jack it back", forcing the player to take another go before reversing the turn order, and that aces change the suit and can be played during the turn regardless of the present suit - the player playing the ace may state any suit as the suit the next player must play to. When the player plays his next-to-last card, he must say "last card", or be forced to pick up seven cards. Generally, numerical effects can be stacked and passed along, as with the above-mentioned variation regarding sevens in Mau Mau, though this rule also applies to eights, with the number of turns missed by the next player increasing by one for each eight played in succession. Other rules allow placing multiple cards of the same value or multiple cards of the same suit and subsequent value. e.g. on a ten of Spades, a player could play three sixes, provided that the one at the bottom of the group was the six of spades. 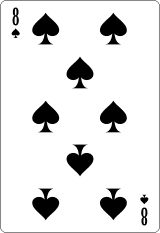 Alternatively, the player could play the three, four and five of spades. Some variations include a "chaining" rule, where the player can link these rules together, and could play the three, four, five and six of spades, the six of hearts, and the six, seven and eight of diamonds. As Switch has generally higher pick up penalties than Mau Mau (some variants include a requirement to pick up five upon the play of a black king, which like a two can be increased and passed along with another black king, for a total of ten cards), this helps the game progress faster, especially if the deck is not shuffled when there are no more face-down cards. Another version including the "chain rule" is that aces (again) change the suit but the black jacks make the next player pick up seven cards and a red jack is the only way of canceling it out. Kings mean you get another go, and queens swap direction of play. David Parlett (in 'The Penguin Book of Card Games', 1978) describes a UK version of Switch where the above rule for aces applies, but an ace can only be played if the player can play no other card. In this variation, no other cards have a special purpose, which keeps it simple for children. Parlett points out that the game works fine for 6-8 players if 2 52-card packs are used. In the UK there exists a variant known as Peanuckle (note that this is not the same as pinochle) in which players must shout "peanuckle" when they only have one card left to play, or draw a card as a forfeit. In an alternative to this, players must shout "peanuckle" when they have two cards left to play and "super-peanuckle" when there is only one card remaining in their hand. This version of the game uses many of the variations listed above. The players are dealt each four cards instead of five. Ace is the card that forces the next player to skip his turn, not 8. The player may play another Ace instead of skipping the turn. The obligation to skip the turn or to play another Ace is then passed to a next player. If a 7 is played, the next player, who would have to draw two cards, can pass this penalty on to the subsequent player by playing a 7 too. This subsequent player must then draw 4 cards. He too could play a 7, requiring the next player to draw 6, etc. The player who draws cards cannot play a card in the same turn. In some variations, King of Spades has the same effect as 7 except that the next player must draw 4 cards. He may play 7 of Spades to pass the penalty on to the next player who must draw 6 cards or play another 7, the penalty then goes to the subsequent player, etc. Similarly, King of Spades may be played on 7 of Spades instead another 7. A Queen can be played on any card (except 7 or Ace if it was played by previous player). The player who plays it then chooses a card suit. The next player then plays as if the Queen was of the chosen suit. In some variations, Jack cannot be played on any card (it has no special meaning). There is no word that a player must say if he has only one card left in his hand. The players are initially dealt five cards each. The loser of a hand starts all subsequent hands with one card fewer. Once a player has lost four hands they therefore start the next hand with only one card. If they lose a further hand they are then out. The winner of each hand plays first on the following hand. A player can play several cards of the same rank together in series, for example if a heart is on top of the discard pile they could play the ace of hearts and the ace of leaves on top of it. The two aces would mean the next two players miss their turns. In some versions it is not possible for players to defend against an ace as they don't have a turn. If a 7 (or several together) is played, the next player has to draw three cards (or six or nine or twelve). He can pass this penalty on to the subsequent player by playing a 7 (or several) too. This subsequent player must then draw three cards for each seven played in total (unless he plays sevens himself, passing the obligation to the next player and increasing it). The Lower (Jack) of Leaves cancels out the obligation to draw cards due to sevens and can have other jacks played on top of it by the same player. An Upper (similar to a Queen although the cards depict men) can be played on any card. The player who plays it then chooses a card suit. The next player then plays as if the Upper was of the chosen suit.